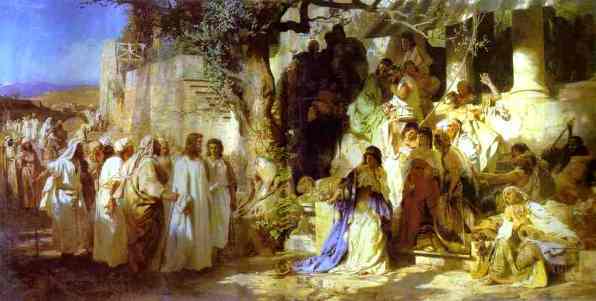 Mary Magdalene was a disciple of Jesus of Nazareth, and probably his financial backer. It is extremely unlikely, well-nigh impossible, that she was a reformed prostitute, but medieval painters loved to show her as such. She was the first witness to the Resurrection, and is called ‘Apostle to the Apostles’, since the risen Christ told her to ‘go and tell’, apostellein in Greek. Jesus appears to Mary Magdalene on Easter morning. She has at first mistaken him for a gardener, but when she realizes her mistake she reaches toward Jesus. Do not touch me, he says, for I am not yet ascended to my father. She is portrayed in two distinct ways: before her conversion she is richly attired, jewelled and gloved, a figure of Profane Love; as a penitent, she wears a simple cloak or is often naked, covered only by her long hair (a very popular theme during the Victorian period). She usually has a crucifix and a skull, and sometimes a whip and a crown of thorns. She reads or meditates or, in Baroque paintings, raises her tear-filled eyes towards a vision of angels in heaven. An angel on the left sits rather casually on the side of the tomb, but the two above Jesus are closer to disembodied spirits – notice that though they have heads and arms, their legs are simply not there. 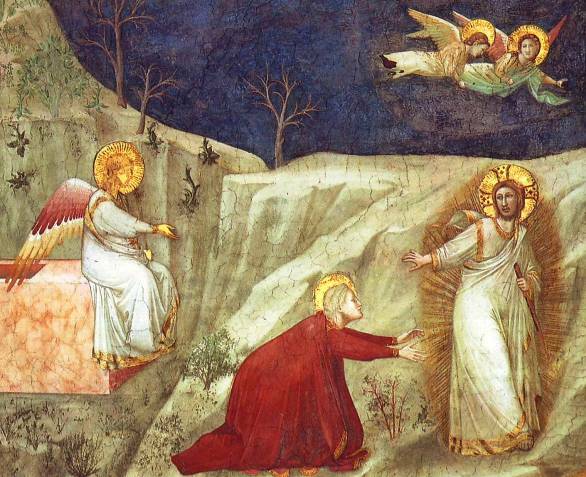 Angels are not corporeal beings, Giotto reminds us. This heightens the sense that Jesus is inhabiting two worlds. 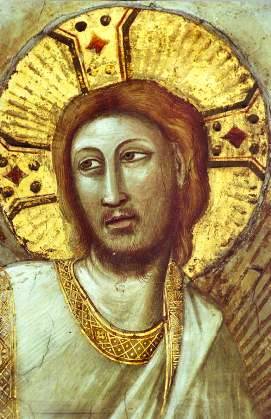 Giotto emphasises the other-worldliness by giving Jesus a human appearance but encasing him in ethereal light and garments. Mary, however, is decidedly not of another world. Her red, semi-transparent silk garment proclaims her as very much alive. 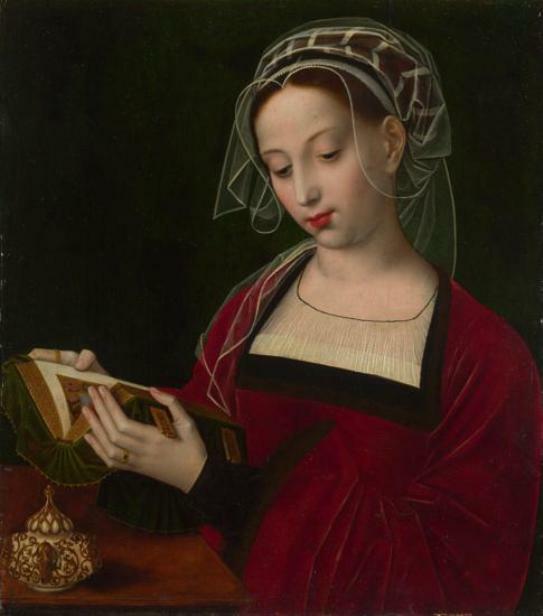 Mary Magdalene was always an important figure in the gospel, but she became even more so after the Counter-Reformation, when the Catholic Church encouraged devotion to the Sacraments, particularly Penance. Mary was seen as the ideal penitent because she supposedly anointed the feet of Jesus. But the woman who did this, whoever she was, was unnamed in the gospel. 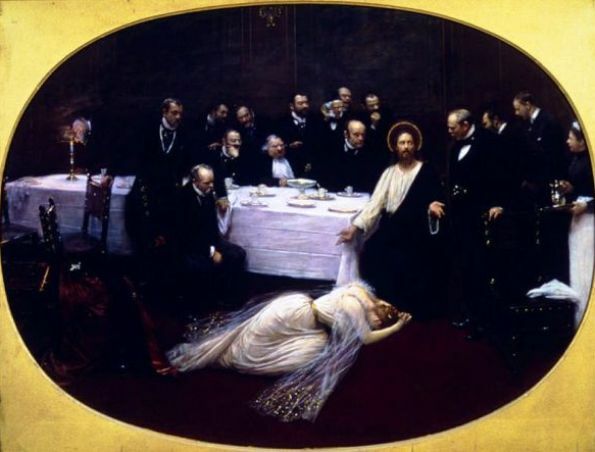 In fact there is no real link between the woman who anointed Jesus, and the woman called Mary Magdalene who was exorcised of seven ‘demons’ – in other words, she was cured of a severe illness. Never mind the facts, go with the myth. 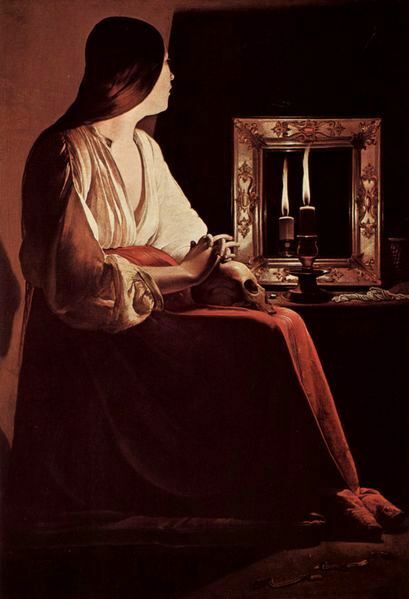 Mary Magdalene is often shown with a jar of ointment. Her hair is untied, long and flowing, sometimes covering her whole body. Mary surveys the mirror, symbol of her former vanity and preoccupation with worldly things. It casts a large shadow. Her beauty remains, but she has clearly become aware of the fact that there is more to life than earthly pleasure. Now, in the stillness of night, she reflects on past events, and on her own transformation through the encounter she has had with Jesus. The skull in Mary’s lap reminds here that Death is inevitable for all creatures, and will come to her as well. It suggests that she should think about the hereafter as well as the present. George de la Tour excelled in the use of light and shadow, and the meditative mood that night brings to all creatures. 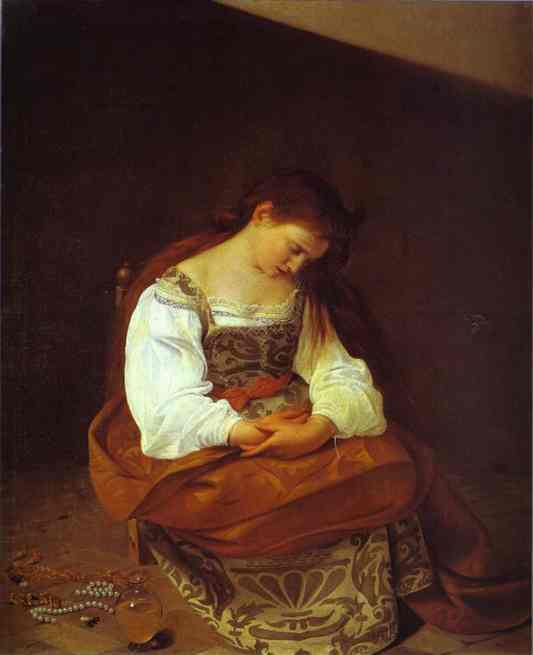 Caravaggio has managed to capture the image of a woman who has come to the end of the road, too tired to look into her future. This is the moment, he suggests, when she is ready to respond to Jesus’ message of redemption. 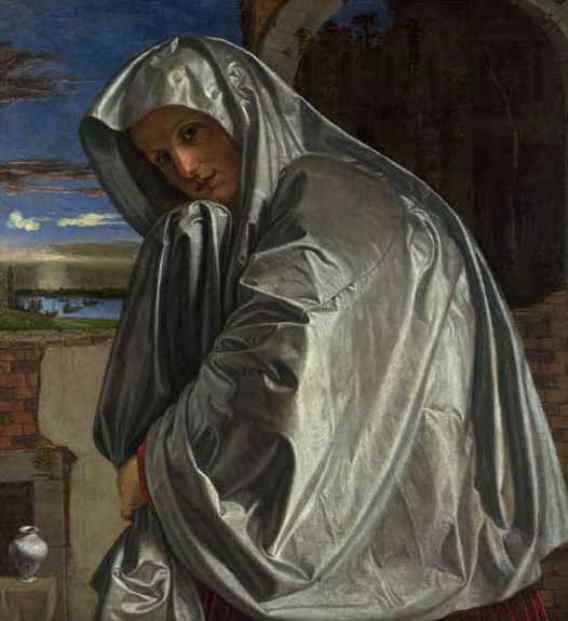 Mary Magdalene is sumptuously dressed, but the discarded jewellery and her slumped figure tell the viewer that she has reached a turning point in her life. Caravaggio portrays her as a rich courtesan, not a common prostitute. In fact, the real Mary Magdalene was neither. She was not the sinner described in Luke 7:36-50, and when Luke does describe an actual prostitute in 15:30, he uses a different word, not ‘sinner’. In popular legend, Mary Magdalene was portrayed as a repentant sinner who retired to a cave in the desert where she became a penitent hermit. She practised every sort of physical penance and privation, to atone for the sins she supposedly had committed before she was cured by Jesus. There is no biblical evidence for this depiction of Mary Magdalene. It derives from popular legend and medieval tradition only. 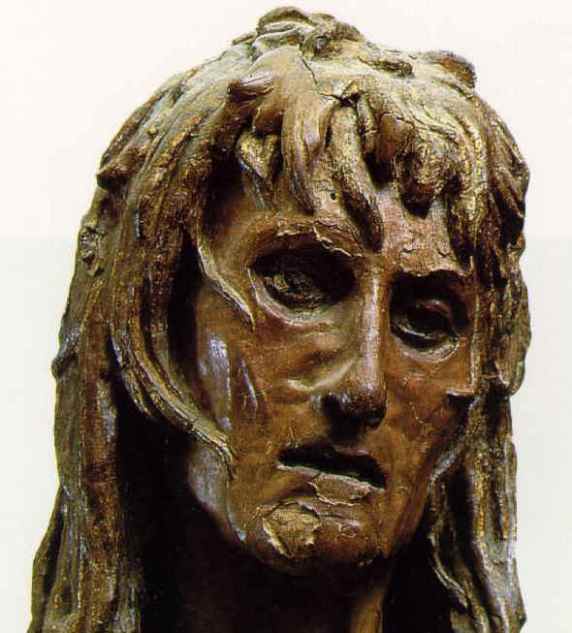 Donatello’s Mary has a thin, exhausted face and matted, filthy hair. Her emaciated body is clad in ragged animal skins. She is barefoot and bare armed. Her repentance is obviously sincere, but her self-abasement is not appealing. The sculpture is currently held in the Duomo Museum, Florence. It had become blackened by time, but after the terrible flood in 1966 it was cleaned and restored to its present appearance. Mary, now repentant and reformed, sits quietly reading. Her life of sin is behind her. Mary alone in the desert, repenting her past sins. In the legends that grew up after her death, Mary is supposed to have repented after meeting Christ; she then spent many years in the desert, where she lamented her past sins. In keeping with this tradition, Canova shows her dressed in the clothing of a hermit. 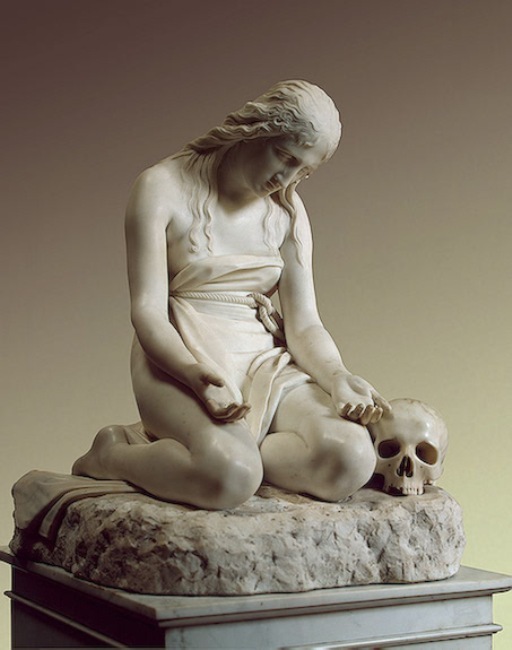 The skull beside her is a reminder of death, which must come to all. The figure of Mary once held a cross, symbol of the Crucifixion. She is clearly grief-stricken and helpless. There is no evidence for any of this in the New Testament.